The ruling Bharatiya Janata Party and the main Opposition party Congress are at loggerheads over the deal. According to the Congress, the government has violated procedure and bought aircraft at a price which is three times higher than what the Manmohan Singh government had negotiated. The Congress has also accused the Modi government of ‘gifting’ offsets to the tune of 3.9 billion euros to Reliance Defence — a company that has no experience of making jets or defence equipment and in the process inflicted massive losses on Hindustan Aeronautics Limited (HAL). On September 23, the Congress released a video featuring Dassault Aviation chairman Eric Trappier. The party claims the video was shot on March 25, 2015, just 17 days before Prime Minister Narendra Modi announced the new Rafale deal. The purported video shows Trappier talking about responsibility sharing on the Rafale contract in the presence of Air Force former chief Arup Raha and HAL chief KL Raju. The Congress has claimed that the video is proof of the fact that Dassault and HAL had almost finalised the agreement. To explore this aspect and HAL’s role in the deal, India Today filed a series of Right to Information queries with the public sector undertaking (PSU). a) What kind of understanding HAL had with Dassault Aviation regarding Rafale fighter jets? b) Did HAL chairman visit the Dassault facility in March 2015? In response to the first question, HAL said, “HAL is not party to Rafale procurement”. 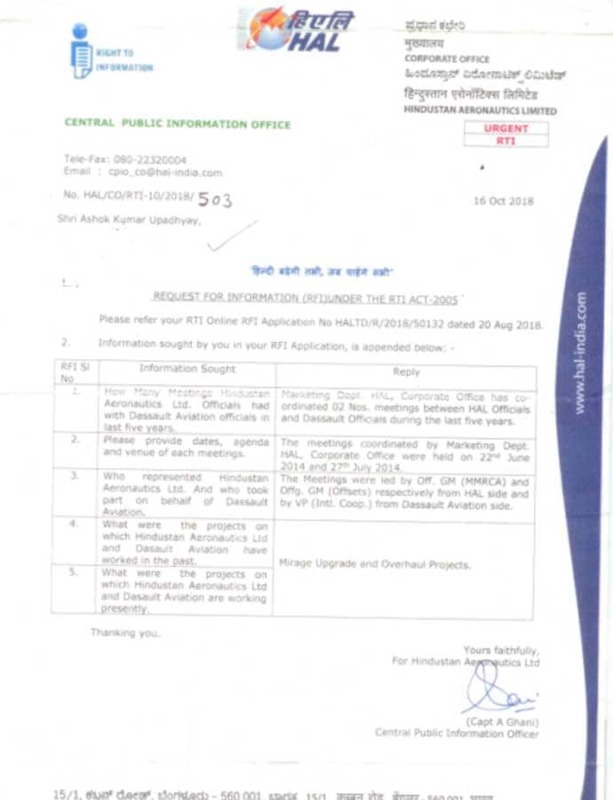 India Today further filed an RTI and asked about meetings between HAL officials and Dassault Aviation officials in the last five years. 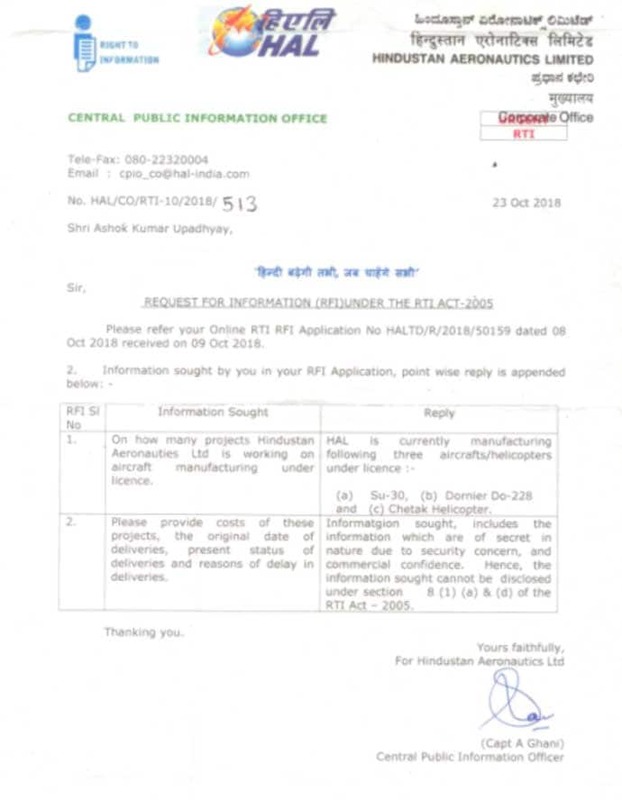 The details that the RTI query sought included dates, agenda and venue of each meeting. It also sought the names of representatives from HAL and Dassault who (if at all) attended these meetings. 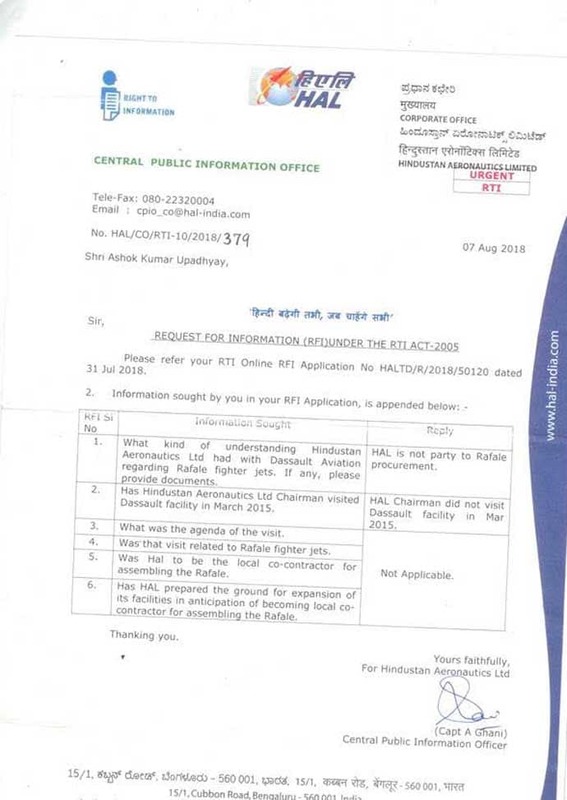 The RTI response India Today received from Hindustan Aeronautics Limited. Though HAL did not divulge the agenda and venue of these meetings, it said that meeting were held between the HAL and Dassault officials in 2014.